Having greatly enjoyed, “Thrones, Dominations,” I was keen to read the second in the Lord Peter Wimsey and Harriet Vane series, continued by author Jill Paton Walsh. This begins in 1939, with England in the early days of the Second World War. Lord Peter is away on a dangerous mission overseas and Harriet has closed up the London house and retreated to Talboys with her two sons, Bredon, aged three, and Paul, who is nearly one. She also has the care of the children of Charles and Mary Parker; Charlie, Polly and Harriet. The local village has changed, with land girls and troops bringing new faces and the community preparing itself for war with air raid practice. Most of the village intend to use the cellars of the local public house as a shelter, but the Methodists are unhappy about taking refuge in a public house, so nearby caves are utilised for them. However, although the practice seems to go well, when the all clear sounds and everyone emerges into the village, it is to find the body of a young woman dead in the middle of the street…With Superintendent Kirk short staffed, he asks Harriet for help. She soon discovers the young lady, Wendy Percival, is nicknamed, “Wicked Wendy,” and is known as something of a flirt. However, although she has caused some disruption among several young men, it seems the case is not going to be a simple one to solve.I really enjoyed this novel, even if I did not find it worked quite as well as the first. I like the fact that Walsh has brought in new characters, although she does seem to want to use them all and sometimes it seems that, despite the advice to only travel where absolutely necessary, almost everyone is haring about the country visiting each other. Still, we have Helen; Harriet’s disapproving sister in law, who is always interesting as a character, the delightful Dowager Duchess and Mary Parker, among others. I thought the author really portrayed the period well and the mystery, if slightly confusing at times, made you think about the choices that sometimes had to be made in war time. I look forward to reading on and will certainly read the next in the series. "If anybody ever marries you, it will be for the pleasure of hearing you talk piffle. "Set in the early days of WW II, this book is an enjoyable, plausible continuation of the Wimsey-Vane marriage post Busman’s Honeymoon, Sayers’ last complete Lord Peter mystery. Walsh created reasonably faithful versions of both the central characters, but somehow was not entirely successful in recreating the spark between them, which for me has always been one of the most delightful aspects of the series since they met in Strong Poison. They do banter, and throw erudite, quotation-laden barbs at each other, but the writing doesn’t quite capture the mordant wit and wry humor of the original. But never mind, as “a facility for quotation covers the absence of original thought”*, anyway. What bothers me more is that Lord Peter doesn’t show up until the story is almost halfway through (he was too busy spying for England behind enemy lines): Walsh’ domesticated Lady Peter (nee Vane) is just not a terribly interesting character in her own right. Where is the woman who, during her busman’s honeymoon, contemplated the word “husband” and came up with “…a repressive word, that, when you came to think of it, compounded of a grumble and a thump”?And Bunter with a wife and kid? Sacrilege! Bunter is the quintessential gentleman’s gentleman and should be solely devoted to Lord Peter for eternity.On the plus side, Walsh’s WW II-in-a-small-English-village setting is perfectly believable, the mystery is coherent (and neatly solved) --- and the book incorporated several letters written in character by Sayers (anything from Honoria Lucasta, Dowager Duchess of Denver is always a fun epistolary treat). So if you badly need your Sayers fix and have gone through all the originals, it is not a bad idea to while away a few enjoyable hours with this book. *Lord Peter Wimsey, Gaudy Night. O, fie on you, Jill Paton Walsh! The ersatz Sayers on offer here is about as convincing as a cubic zirconia - for example, the way Walsh spells every damn thing out makes it clear that she doesn't trust her readers to be intelligent, where Sayers alludes to literature without attribution and makes the occasional important point in untranslated French or Latin (placet?). What's worse, reading Walsh's fake Sayers makes me more critical of the real Sayers, to the point of not enjoying it as much. One wishes the real Sayers had been as productive as, say, Christie - but failing that, we should all write fanfic and skip this crap. Ruth Rendell wondered, "Will Paton Walsh do it again?" My answer? Unfortunately, yes. Paton Walsh does not have the classic background of a Sayers. One of the delights of reading Sayers' work is all the quotations she would sprinkle through the pages. Not just to say, "look what I know" but as a natural part of the characters of Peter and Harriet. Paton Walsh may write very good mysteries of her own...but she really doesn't do Lord Peter well. I've read the Wimsey papers that this story is based on. As fragmentary as those are they are far superior to this novel--with all the flavor of Sayers' writing. This has none. It was never going to be anything but five stars methinks.Another tour de force from Jill Paton Walsh. I finished this book feeling satisfactorily replete. I really, really like Harriet and Peter. The writing is spare and elegant. The evocation of time and place is spot on. And the storyline is just complex enough to make it interesting. The outbreak of Second World War finds Lord Peter Wimsey’s family — his wife Harriet Vane and their two toddler sons — and Lord Peter’s nieces and nephew moved from London to the relative security of the village of Paggleham in Hertfordshire. Lord Peter has moonlighted as a pseudo-diplomat for Her Majesty’s Home Office in several of the novels, but, with the outbreak of the Second World War, he spends more time on the Continent than he does in England. So it is Harriet (now more often called Lady Peter) who bears the brunt of the investigation into the murder of a promiscuous Land Girl named Wendy Percival. The girl’s tarty ways had led to her being called “Wicked Wendy” behind her back, but who would want to kill her?Harriet, asking on the official request of police Superintendent Kirk, begins questioning Wicked Wendy’s fellow Land Girls and her flock of would-be suitors. However, the mentally suspect retired dentist Mrs. Spright insists that the sleepy village of Paggleham provides a superb hiding place for a nest of German spies; he blames them for Wendy Percival’s death. Could this far-fetched claim be true? Or have the pressures of war pushed Mrs. Spright into paranoid delusion? Author Jill Paton Walsh crafted A Presumption of Death from a series by Dorothy L. Sayers that ran in the Spectator during three months in the winter of 1939–40 purporting to be letters written by one Wimsey family member to another family member or to a character from one of the novels. The “letters” — termed The Wimsey Papers — were the standard morale-boosting fare popular in the Allied press, and they dwell on everyday life, as such letters would in real life: rationing, black-outs, air raid practices, and the exodus of young men; however, the letters also allowed Sayers to opine on the execution of the war and on other political matters. Walsh skillfully uses these threads to weave a most excellent mystery — rather better than Thrones, Dominations, in my opinion. In addition, I loved the glimpse into the Home Front during the so-called Phony War. I also appreciated that Walsh introduces more twists than Sayers usually did in her Lord Peter Wimsey novels — although readers will see one of them coming long before Harriet does.Some readers decry that Lord Peter comes into the novel so late; however, I loved seeing Harriet practice what she has so long studied for writing her Robert Templeton mystery novels and what she learned working with her husband. Ms. Walsh, don’t listen to the naysayers. We want more Harriet Vane, not less! Alas! The Lord Peter Wimsey stories and novels are my favorite mysteries of all time, and Jill Paton Walsh did a beautiful job of completing Dorothy Sayers' unfinished novel, "Thrones, Dominations," after the writer's death. This novel is more completely from Walsh's imagination, and it shows. Its inspiration comes from several short articles and notes that Sayers published during World War II, describing the Wimsey family's challenges. However, its weak plot--Harriet and Peter working together (long-distance) to solve the village murder of one of the "land-girls" during an air raid practice drill--is Walsh's own. While it includes many of the elements Sayers employed so cleverly--codes, spies, literary references--the spark that made the characters real is completely missing. I hate to say it, but this book is barely worth the time. The murder plot is lame and overly complicated (think HAVE HIS CARCASE but without Sayers' wit to save the day). And what is up with Walsh messing up the kids' names? Surely a little research wasn't beyond her? I find it difficult to believe that these people really are Lord Peter and Harriett. Where I got the book: my bookshelf.All in all, this is probably the weakest of the Paton Walsh Wimsey books. Paton Walsh does a reasonable facsimile of Sayers' high-life dialogue, but falls down when it comes to rendering the speech of ordinary people--and this novel puts the Wimseys among the villagers of Paggleham, where Harriet and the children are escaping from the London Blitz while Peter--who, by this time, must be getting a bit geriatric for intelligence work--goes off to Destinations Unknown to do something or the other, purely, I suspect, to raise tension as Harriet worries whether he'll return.Paton Walsh seems determined to get as many characters from the Wimsey books into this one as possible, along with some code-breaking à la The Nine Tailors. The overall effect is something of a patchwork pastiche, not altogether pleasing to the palate. She's imitating the wartime Wimsey stories, of course; ghoul as I am, I'd much rather she'd dealt with the death of young Jerry, because she handles Wimsey tragic better than Wimsey whimsical.One for the fans, entirely, with nothing much to commend it to the general reader. An OK mystery, but just OK.
Had read this book some years ago & was appalled at how bad it is. It's a mystery to me how Sayers' Trustees allowed Paton Walsh to publish "The Attenbury Emeralds" & "The Late Scholar". If I were a Trustee, I'd have booted her from the Sayers Production Line immediately. In fact, I was wondering a few days ago (after abandoning "The Late Scholar") who could possibly write Wimsey novels with the same flair, erudition & readability as Sayers. The one & only possibility that came up was Antonia Forest. Too bad she's dead..."A Presumption of Death" is so awful that I felt embarrassed, reading it. Not embarrassed to be SEEN reading it, or to admit to having read it. But embarrassed for Jill Paton Walsh that she actually thought it good enough to shove into the maws of a reading public. Who might then respond the way I have. A continuation of the Peter Wimsey/Harriot Vane family story. The author finished a manuscript which Dorthey Sayers was working on at the time of her death for the book 'Thrones, Dominions' so I guess she thought she could write another story all on her own. I believe there are elements of the story that she has says Sayers was working on so it isn't entirely her own work. However, she just isn't Dorthey Sayers and can't write as well. Eh, she's not Sayers by a long shot, but it's not too bad.The characters aren't Sayers. They're random people with Sayers' character names. The plot is pretty thin, and all the wartime "historical" stuff didn't really add anything.Pretty disappointing overall. I would not recommend this to a Sayers fan looking for more of the same. Sigh. It's just not Sayers. It lacks the sparkle, the wit, the new and evolving facets of Peter and Harriet's characters that mark each book. This is imitative, and while proficient in certain respects, it is not original and so disappoints. Not as good as Thrones, Dominations, but it's still doing the job. I read somewhere that Jill Paton Walsh was such a fan of Harriet Vane's that Gaudy Night inspired her to attend Oxford. It's a wonderful little detail, and I love hearing stuff like that. But unfortunately for me as a Lord Peter Wimsey fan, it seems that Walsh's identification with Harriet means that Lord Peter is being winnowed out of her version of Sayers's stories almost completely.So once again, as with Walsh's Sayers continuation Thrones, Dominations, we have a solid, competently written book that doesn't feel much like part of the "Lord Peter" series except in name only. Most of the book takes place in WWII England, at Talboys (Harriet's childhood home, and the setting of Busman's Honeymoon), and Peter is absent for most of the book, off on mysterious wartime missions.I really felt like this Harriet-centric narrative device was a mistake. We're left with Harriet's rather straightforward, plainer personality, and without even a little of the Wimsey sparkle, the book drags for long sections. The only relief is a surprisingly enjoyable portrait of Bunter, whose character is believably expanded and who is one of the book's bright spots. But nobody else really feels like themselves. In Walsh's hands, Harriet lacks the quiet wit that marked her in Sayers's work, and here she's more humorless than ever. Kirk and Twitterton are both rather grim and seem to return just for fan-service (and they're completely unlike their Busman's Honeymoon selves). But it's the bright, mercurial characters that suffer most -- the Dowager is, like Peter, barely recognizable in Walsh's hands -- a shadow of her usually wonderful, rambling, stream-of-consciousness self, Jerry (Pickled Gherkins) is utterly lacking his usual breezy charm, and worst of all, Walsh cannot even seem to write Miss Climpson, who is presented without her ever-present breathless over-emphasis and italics (surely Miss Climpson's funny and faintly breathless and distinctive voice (!!!) could have and should have been better captured). It's as if Walsh is writing these faintly dry, academic, competent fan-fictions that happen to include Sayers characters, but she can't seem to capture the real vividness of the characters themselves.Lord Peter does return to the narrative here eventually, but he's once again rather sparkless. It's not that I think he should be dancing jigs in wartime, but Lord Peter does tend to whistle in the dark, and in addition to that, a sense of humor can be slyly evident as a personality trait even under pressure. With Lord Peter, in fact? Especially under pressure!But not here. As before, the character just doesn't feel much like Lord Peter at all -- once again, Walsh's take on Lord Peter is rather humorless and stuffy, with little wit or wordplay. Worst of all, she has Lord Peter apologizing repeatedly for being so "foolish" in the past -- this comes up repeatedly, and annoyed me a lot. Lord Peter's 'laughing on the outside' tomfoolery isn't actually foolish, and that's what's fun about the character. He's usually clowning around right when the danger is greatest or when his heart is breaking -- so for Walsh to essentially dismiss and criticize the earlier Sayers (real) Lord Peter as some kind of flighty annoyance is upsetting if you're a fan of the series.While this was an interesting story that brought to life WWII Britain, I ultimately felt this one was less successful than Thrones, Dominations, which I also felt was simply an okay mystery, and a substandard attempt at Lord Peter. However, where Thrones offered a mystery that felt like Sayers, the mystery here not only is very oddly presented and explored, it's almost thrown away by the end of the book. Both books are well-researched and presented, and Walsh obviously enjoys Sayers's works, but it's like hearing a barely competent musician play Mozart -- there's little real feeling to what feels like an almost academic exercise.I will keep reading Walsh's take -- substandard Lord Peter is better in a weird way than none at all, and I'm interested to see where she takes the characters. But it's been a quiet disappointment, as she has taken so much of the dazzle and dash of one of my favorite characters and made him rather ordinary -- that's the real crime here.I hope I'm explaining myself well. It's a decent book, but in it we see only the palest reflection of one of the great literary characters of all time. As an example -- one of my favorite moments in the Lord Peter Wimsey series is a moment in the book Strong Poison, when Lord Peter is rambling humorously at Harriet about the case (while making yet another marriage proposal), and charmed in spite of herself, she tells him that if anyone ever does marry him, it will be for the pleasure of hearing him "talk piffle. "That's my problem with Walsh's take on the characters. There's plenty of mystery -- but no piffle. I am a huge fan of the Lord Peter Wimsey mysteries by Dorothy Sayers, and I was cautiously optimistic when I discovered that there were additional mysteries written by Jill Paton Walsh based loosely on notes written by Dorothy Sayers. There generally has not been a good track record of sequels of this sort, but the Lord Peter Wimsey/Harriet Vane series seems to be an exception.The mystery set in this book mostly falls to Harriet Vane to solve, but all of your favorite characters are there, from the Dowager Duchess of Denver to Mary and Charles Parker to the current Duke and Duchess of Denver. And, of course, Harriet and Peter. As for how convincing the book is as a worthy sequel, I think the book holds up pretty well. Think of it as the first carbon copy of the original (I know--I date myself). The book is a strong and clean copy but definitely a derivative of the original. The most notable derivative is the Dowager Duchess. I adore her character and her unique combination of insight and rambling. In this book, she is there but is not quite her original idiosyncratic self, although still quite appealing.The mystery is a solid Sayers mystery, with interesting secondary characters and the ubiquitous Bunter. All in all, this is a solid addition to the Lord Peter Wimsey canon. 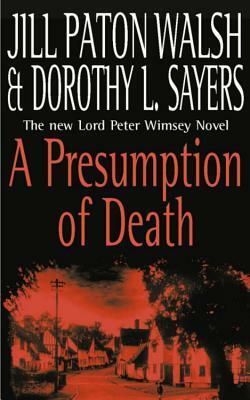 A PRESUMPTION OF DEATH (Trad Mys-Harriet Vane-England-WWII) - ExWalsh, Jill Payton and Dorothy L. Sayers – Last in series (EMBRG Selection)New English Library Ltd, 2003, US Paperback – ISBN: 978-0340820674It’s WWII and Lord Peter is away on a mission. Harriet has moved the household to the country for safety. Emerging from shelter after an air-raid, the body of a land-girl is found in the street. It wasn’t bombs that killer her, but a quick lethal physical killing. The local police superintendent asks Harriet (Lady Peter) for help in the investigation.Although the classic mystery was certainly there, in this book, this was much more. The mystery plot was well done with plenty of twisty bits to it. However, it was the reflection of citizen life during the war that was most interesting to me. From the chatty letters at the open and close, to rationing and ways of “enhancing” it, to the secrecy and suspicion of the time, I found it fascinating. I must admit, I do enjoy Sayers/Walsh’s literary games the characters play and the clever use made of them in the plot for decoding a message. I thoroughly enjoyed this book. After finishing an unfinished Sayers draft in Thrones and Dominations, Paton Walsh bases herself on published Sayers articles to create this one and succeeds rather well. We are very much in the world of Busmans Honeymoon mixed with that last glimpse of Lord Peter and family that Sayers provided in the short story Talboys. We find Harriet and the kids, including Mary and Charles Parker's two evacuated from London to Talboys in the early days of WWII. The phony war is captured nicely and so are the different Paggleham charcters that we have come to know in Busman's honeymoon. Peter and Bunter are absent for a good part of the novel - on secret mission on the continent. Paton Walsh thus continues Sayers work from Gaudy Night building Harriet into the central character. She does it well and the relationship between the different members of the closer and ndeed the wider Wimsey family is well developed. The whodunnit as such has the lightness combined with rather profound questions that is characteristic of Sayers. I've been on a Peter Wimsey and Harriet Vane binge lately. Over the past few weeks I've read all of the Sayers novels involving them. That is, I've re-read the ones that Dorothy L Sayers wrote, and then started reading the Jill Paton Walsh continuations. I quite liked Thrones, Dominations, althougth I didn't think it was entirely successful. This one I liked much more. I enjoyed the evocation of the early WWII years and felt that Paton Walsh portrayed Peter and Harriet in a way which was true to their creator. I'm now reading (and now very much enjoying) The Attenbury Emeralds. It is going to be so very hard to leave my favourite literary couple behind! Normally I am dead-set against authors continuing the efforts of another author. However, there are always exceptions, and Jillian Walsh is one of them. A Presumption of Death is a very fast, satisfying read. I do enjoy Harriet Vane, and Walsh does an almost-seamless job picking up where Sayers left off. The part of the book I thought felt least Sayers-like, the letters (I thought they came off too forced) turns out to be the only part entirely written by Sayers, so that goes to show how much I know. The Lord Peter Wimsey novels are the epitome of what a good historical mystery should be. Well-paced and nicely-detailed (without overdoing it) and absorbing. I highly recommend this book. Jill Paton Walsh has done an amazing job in bringing the characters in this story to life, after residing for such a long time in Dorothy Sayer's notebook.A really well-developed plot, with great insights into the lives of the different classes of people living through the war in Britain. Well-strewn with red herrings, the ending was a complete surprise. My only question was whether or not the morse code was deciphered - what messages had been sent? Definitely worth reading this one! With Thrones and Dominations and Presumption of Death, Jill Paton Walsh manages to accomplish two demi-miracles--to provide worthy successors to the memorable novels of Dorothy L. Sayers and to write a passionate account of a marriage between two intellectual equals. I particularly enjoyed the second novel, set in a village in wartime England. Lord Peter is off on a secret mission and Harriet is not only keeping the home fires burning, but investigating a murder of a land girl whose unsolved death is breeding distrust and unease among the villagers. The second Wimsey/Vane book authored by Jill Paton Walsh as successor to Dorothy Sayers--and it's even better than the first (Thrones, Dominations). A great plot with an interesting mystery, a look at life on the "British home front" during WWII, and unforgettable scenes with Bunter and of Harriet decoding a message that could save Peter's life. Brava! Not bad as a continuation of Sayers' great series. Walsh does a great job bringing Lord Peter and Harriet to life, a so so job on other characters, and not such a great job on the mystery. I did enjoy the evocation of war time England, but it was overdone until it started feeling a bit like a lecture disguised as a novel. Not enough Wimsey in this one. Sounds like Walsh had much less of Sayers' writing to go on than with Thrones, Dominations and it shows all around.Re-read - listened 4/15. Liked it better this time. Upping from two to three. I loved all of the Peter Wimsey mysteries by Dorothy Sayers. This "completed" posthumous final one is not worth the time. Don't recomment it. Jill paton bring on more in the Sayers style! Second in the Lord Peter Wimsey / Harriet Vane secondary historical mystery series that carries on from the original Lord Peter Wimsey series by Dorothy Sayers.My TakeThere's a subtle difference between this story and Thrones, Dominations. And it could well be just my imagination not believing that Walsh could do as well as Sayers. It is a cleverly written story. Walsh has used a series of letters Sayers wrote for the Spectator as the bones for this story. And I'm most grateful.I did thoroughly enjoy this story, and, yes, part of the reason could well be that I simply adore the characters and am desperate to not have to end my acquaintance with them.That said, this was an interesting look at living in an English village during wartime with all the lack of privacy that comes from living in one another's pockets and the subterfuge used to get around rationing. What with pig-sharing and secret egg stashes. There's also the countryside's view of the young children who were sent out to them and the trials and tribulations experienced by the villagers in dealing with this influx.A very Wimsey-ical comment: to light up the Albert Memorial to make it easier for Hitler's bombs to find it.Part of Duke's Denver has been taken over to use as a boys' school and it irks the hell out of Helen. Fortunately, she's rarely there and Gerald really gets into it. An enjoyment Helen would have put a stop to.Oh lord, then there's one of the children telling Mummy [Harriet] that he thinks he would understand better "if only you wouldn't explain".There's an interesting amount of criticism about the war, mostly about the uselessness of politicians. Neville Chamberlain starts as the prime minister, but it isn't that long before Winston Churchill is giving his famous speech.Crack me up! The dowager duchess is concerned about finding a gas mask that will match the dress-pattern exactly! What? Is Harriet going to color coordinate whenever the air raid sirens sound? The duchess does sound off on an interesting note about the conflict between grown-ups who want children to be children for so very long while children are so anxious to grow up. She mentions the Wimseys in the past who accomplished so very much while still in their teens because they weren't treated as children. An interesting dichotomy.This seems like a loose end when, early in the story, St. George strongly suggests that Harriet move herself and the children to Duke's Denver. But then nothing seems to come of this.Yes, war can be quite effective at creating changes. At one point, Miss Climpson writes that "one young lady...standing in for her brother…" at an armaments factory is shocked by how easy the work is. And this after listening to him complain about how hard it is. That it's opened her eyes and she won't be doing any more waiting on anybody.Ooh, this was interesting...Bunter is making lead shot, and I recently read a post on the man who discovered an efficient way to create round lead shot. Oooh, gross. My imagination was accurately at work about the illegal slaughtering that occurred in the Wimseys' slaughtering shed. Ick, ick, ick…!I love this series. It's a little bit Agatha Christie and a little bit Dorothy Dunnett. Homey and intellectual in a warm and cozy way.And Harriet comes to realize how very much she loves her husband.The StoryPeter is off spying and Harriet has retreated to Talboys in Hertfordshire with their two sons and Lady Mary and Parker's three children. It's an awkward spot for Harriet. On the one hand she's Dr. Vane's daughter returned. On the other hand, she's returned as Lady Peter Wimsey.Still, it does provide Harriet with breathing space to find a common ground between the two. A place where she can be comfortable. And, with Peter away doing dangerous work, Superintendent Kirk soon helps to occupy her time.The CharactersHarriet, Lady Peter, is an author of detective stories and she is married to Lord Peter Wimsey, who has run off to do his usual run of spying and diplomacy for the Foreign Office. They have two children now: Bredon is three and Paul is a year old. Lady Mary and CID Chief Inspector Charles Parker's children are with Harriet as it's safer there for the children. Charles Peter is ten (call him Charlie); Mary is called Polly; and, little Harriet is three. Mrs. Trapp has come into the country with them while Bunter is off with Peter. Hope Fanshaw Bunter is doing some sort of war work with her photography while their baby is staying with her parents. Sadie and Queenie are the Talboy maids.Sam Bateson from the next door farm is young Charlie's best friend. John Bateson is his dad and one of the pig-sharers along with the Ruddles, Twitteron, Goodacre, the Lugs, Puffets, Wimseys, Simcox, and the Raikes. Dang, these must be some really big pigs!Honoria Lucasta Wimsey is the Dowager Duchess of Denver, Peter's mother. She's an absolute sweetheart. Gerald is another son, the oldest, and therefore the Duke of Denver. Jerry is Lord St. George, the heir, and he's signed up with the Royal Air Force. He's still pushing his luck with Harriet; especially now that Peter's away. He does however bring young Charlie a crystal set that he and Sam spend hours over. Helen is the current duchess and a major pain. She's demanding that Harriet apply to boarding school for Bredon. Personally, I think the English should aim Helen at the Germans. They'd surrender within days, if not hours.Miss Aggie Twitterton is a 40-something maiden lady whom we first met in Busman's Honeymoon; she keeps hens and is said to be haunting the lanes late at night. Jake Datchett, a farmer's son, and Archie Lugg, Fred's son who works as a handyman, were both involved with Wicked Wendy. Fred Lugg is fire watching the night Wicked Wendy is found; he's the village undertaker. Mrs. Ruddle is a gossipy thing, always dropping in on Mrs. Trapp; her husband Bert is doing up bunkbeds for the Methodists in their air raid shelter. Constable Jack Baker doesn't seem to do much other than count heads during air raids. Mrs. Susan Hodge owns the cottage Harriet would like to rent or put the land-girls in. George Withers owns the garden with the unusual harvest. Simon Goodacre is the vicar whose wife tracks which villager can handle how many refugees. Dr. Jellyfield is the village doctor. Mr. Gudgeon and his wife run the village pub, the Crown, where the Presbyterians shelter from the air raids. Mrs. Spright used to be a dentist over at Broxford only she's retired and seeing Germans behind every bush. Sometimes she's even right! Mrs. Marbleham, formerly of London, is most upset about living above a greengrocer; she and her family won't be eating any of that pig's forage! Flight Lieutenant Alan Brinklow has a broken ankle from having to bail out from his plane and he's recuperating in the village at Yew Tree Lane cottage.Superintendent Kirk asks Harriet for help since Lord Peter isn't available. Bungo is something with some hush-hush department. He shows up at Talboys with a cipher that only Harriet can decode.The land-girls include Wendy Percival, a.k.a., Wicked Wendy, is out gallivanting as much as she can of an evening. Of good family, she's done some traveling and knew several languages. Muriel is the suspicious one while Rita is only a touch more friendly. Brigadier Baldock is in charge over at Steen Manor where John Birdlap, one of Wendy's suitors, is stationed.Miss Climpson is put to work by Harriet. Mrs. Quarley is Joan's mother. Joan was supposed to marry Brinklow and, um, she's pregnant. Jeff Quarley is a pilot and Joan's brother. He also moonlights as Mike Newcastle. He certainly does have some good reasons. Wing-Commander Thompson is his CO.The CoverThe cover is golden and red. The top half is a gold background with black silhouettes in a montage of events in the story from Harriet walking down the lane, the church where the fire warden squats, to the warplanes flying overhead. The bottom half of the cover is red with a gold title.Well, it is A Presumption of Death which creates the possibility of the imposture in the first place.